Each Mephisto Waltz is a devilish, whirling dance, showing off Franz Liszt's dazzling mastery of energy. They're named after the devil, Mephisto, in the German Faust legend. Mephisto Waltz No. 1 is by far the most famous, with pianists the world over using it as a vehicle to show off their speed and skill. Liszt's super-virtuoso musical style is brilliantly displayed in these pieces. They also reflect his fascination with the devil and program music (music which describes something). 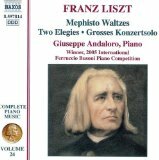 Liszt wrote four Mephisto Waltzes in total throughout his life. He composed the first one in 1859, and the other three near the end of his life in the 1880s. He didn't manage to finish the Fourth one before he died, but a playable version was published in the 1950s. Because he wrote them at different times during his life, they each have a distinctive sound. The first is more conventional, with breakneck speeds and lots of complex patterns. Advanced pianists only! But the later ones are typical of Liszt's more experimental music. They're not nearly as difficult to perform. They focus much more on trying out new and interesting twists on conventional music theory instead of just blindly showing off. The first waltz, written between 1859 and 1862, describes a scene with Faust (the philosopher who sells his soul for passion) and Mephisto (the devil) in a village tavern. A mad wedding feast is underway, and Faust wants to join in. Mephisto grabs a violin and starts playing a wild and seductive melody. Faust dances insanely with a beautiful girl, and the pair whirl away into the night. Liszt does an excellent job of portraying the evil temptations generated by Mephisto, gleefully luring Faust and the villagers into sin. The piece starts with a clever and celebrated imitation of a violin tuning up, to set the mood for the torrent of sound that follows. A lot of pianists take it too far though. Trying to show off, they play way too fast, and forget that the piece is a waltz to be danced to. Oh dear! Here's a wonderful video of a solo violin version of the first Waltz, transcribed by the famous violinist Nathan Milstein. Close your eyes, and imagine the devil himself playing this in a dirty tavern in the German countryside!! The second of the waltzes came roughly 20 years after the first, in 1881. Of course, Liszt had changed a lot in two decades, so this waltz reflects his mature talents. Full of devilish chords and dark sounds, it stretches the boundaries of harmony. It even looks forward to some of the bizarre things which composers would start to do in the 20th century. Liszt also wrote an orchestral version of this waltz, which uses the colorful palette of the orchestra to really bring this passionate and frenetic dance alive. This waltz, from 1883, is even more radical than the last. Music academics can't even name some of the strange harmonies in this piece!! It's a mysterious masterpiece, full of exciting warmth and brightness. It sounds modern even today. I see it as existing on a deeper level than the previous two waltzes. Liszt began his final Waltz in 1885, but died the next year before he could finish it. Still, a playable version exists, which was rescued from Liszt's sketches. It's not as exotic as the third waltz, but still has a mysterious glowing quality. Of course I have to mention the brilliant recordings of Leslie Howard, which appear on his massive 95 CD (Hyperion label) set of Liszt's complete works. His playing is energetic, dazzling, and full of frantic evil. Great stuff! He also gets bonus points for hacking together a playable version of the fourth waltz from Liszt's unfinished notes. A special mention goes to Mikhail Lidsky, who has a recording of the pieces and a few other Liszt dances on Denon Records. His performance of the 3rd Waltz is waaaaaay too slow, but I have a special fondness for his more measured approach to the second Waltz. He manages to draw out the power and majesty of the piece without sounding rushed. A good, cheap CD of all four Mephisto Waltzes is the recording by Giuseppe Andaloro on Naxos. I like this recording because Andaloro manages to get quite a rich sound from the piano, and has a great sense of rhythm, which of course you need for these fast dance pieces!! You might be interested in Liszt's Hungarian Rhapsodies, also packed with the composer's signature keyboard acrobatics.